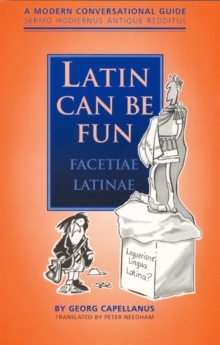 Latin Can Be Fun, by Georg Capellanus, contains hundreds of useful expressions and phrases for everyday life. From breakfast to dinner and workdays to holidays, to chatting at the bus stops or cheering the Queen, it's lively, entertaining and contemporary - all guaranteed to make learning Latin effortless. This revised edition of a worldwide bestseller covers the latest technological developments, delivering Latin alive and kicking into the twenty-first century. Georg Capellanus adds a new dimension to learning Latin, making it more relevant for language teaching and fun for all students. Originating in Germany, Latin Can Be Fun was translated, adapted and updated by Peter Needham, classics master at Eton College, with the wish that all his pupils might merit a perbene Latine loqueris.